Welcome to the September Pals Blog Hop. This month we are showing off our favorite new products from the new Stampin' Up! Holiday Catalog. We hope you enjoy our projects! You may just be starting the blog hop or may have come from stop #3 Susan Lankford at Stamp and Create With Susan on the Pals Hop. If you get off track at any time, the full lineup below will help you move along from blog to blog so you see all of the amazing creations. The 2014 Holiday catalog is so packed full of amazing products and ideas, it was hard to choose just one, so I went with a 3D theme to showcase a number of new products. The Under the Tree Specialty DSP isn't just for under the tree! 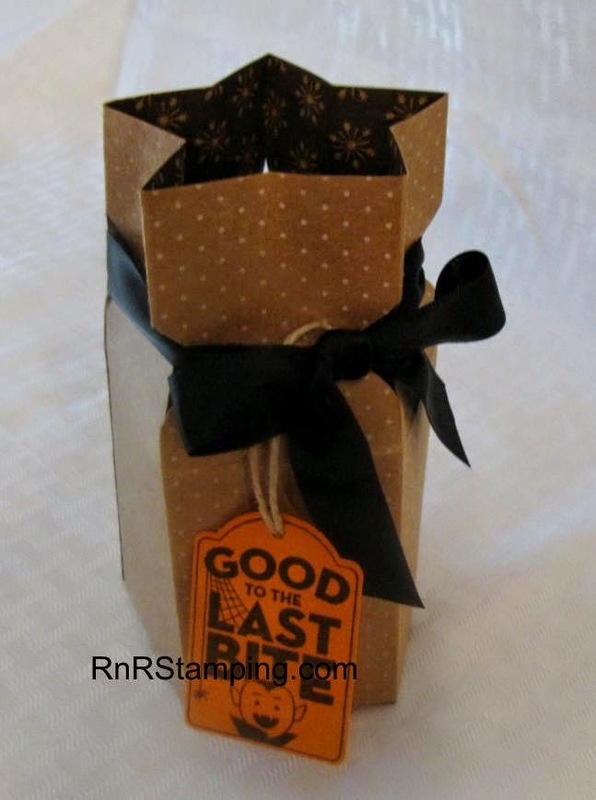 The heavy duty paper will hold lots of yummy Halloween treats in this sturdy star bag. The Merry Everything bundle includes images for each upcoming holiday and the coordinating punch to make your holiday treat packages come together quickly. and Very Vanilla Satin Ribbon. 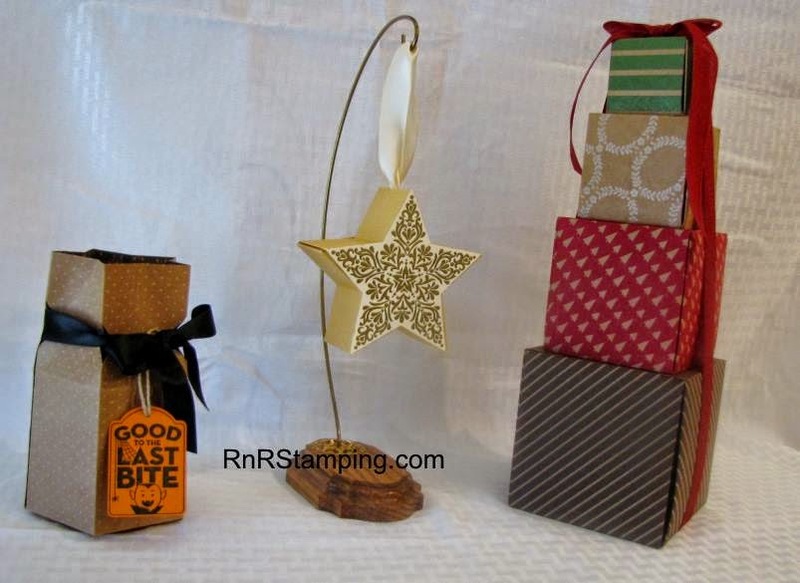 Click here to view a video tutorial by Stampin' Up! One of the darlings of the holiday catalog and a perfect match for the Under the Tree DSP is the Gift Box Punch Board. 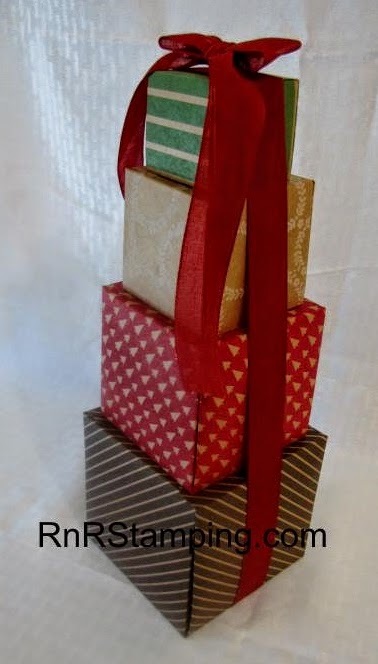 The board makes 15 different sized boxes to fill with gifts, treats or pile them high, as I have done and wrap them with the sensational Cherry Cobbler 1" Sheer Ribbon for use in your home decor. and start creating in 3D. 'Tis the season! The next stop is #5 Becky Gifford at The Social Stamper on the Pals Blog Hop! Thanks for visiting and I hope to see you next month. The amazing crafter line up! Love your cute ideas and your blog presentation. Love these! I have GOT to get that Gift Box Punch Board!!! Sue, you have got those boxes and stars DOWN! I love your creative projects and that star bag is so fun!! OMG, your projects are all wonderful, but I love that hanging star! Yes! I now want to break out my sticky strip and create in 3D!! I'm seeing adorable stars! Love all your gorgeous projects. All your projects are awesome! Thanks for sharing! Love your great star projects! The star bag is very unique! Beautiful! I have to get my box punch board out of the box now!! Love your 3D ideas. I just love the box board. Can't wait to try your ideas. Oh wow...fabulous projects - my personal fav and one I would love to make is the Star Bag for Halloween...hoping you will share the how-to! Your star box and the the Gift Box stack...really wonderful!!! You have provided a LOT of inspiration - thank you!